Sometimes i ever look for an essential file in so many folders - that routine bothers me. Yeah, absolutely if those folders are all yellow, yellow, and yellow... It makes me tired of opening folder after folder to see what’s inside. I think it should be easier to find information necessary to us if those folders have been already marked before. So what's a good application to mark a folder in Windows? I usually use 'Folder Marker' to mark my folders. One mouse-click and it becomes clear at once which documents have a high priority, and which of them have a normal or low priority. It is easy to see which operations have been finished completely, which are partly done and which haven't been started yet. Folder Marker Free is a freeware add-on for Windows lets you mark folders with color-coded icons to make a search for important information a "one-glance" affair. 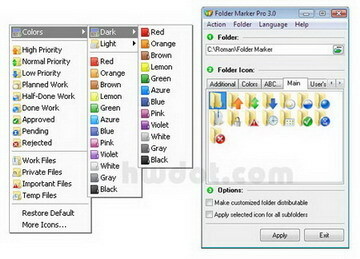 Folder icons can be customized using the standard Windows method, but with Folder Marker Free you can do this on the fly from the right-click menu of a folder. So there is no need to go through additional dialogs or run Folder Marker Free itself! Simply select the folder you want to mark, right-click on its icon and select a color-coded icon from the drop-down menu. The icon will be assigned to the folder at once. 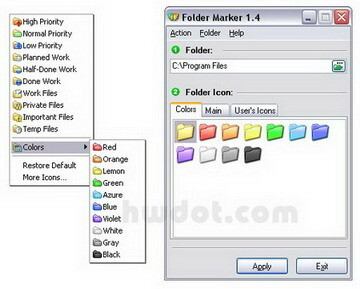 >> Folder Marker Free is a freeware, the license is FREE. You can download it from here. >> In case the freebie is not enough for you, there's a Pro version, Folder Marker Pro, screenshots follow after the jump. 2 comments on "How to change Yellow-Folder Standard-Colors to MoRe CusTomiZed with Folder Marker Free"
Hi ,thank you for useful article .Is there any way to change color of folder s name !